A cultivar of Dendranthema x grandiflorum Kitam. Ranunculus flowered chrysanthemum. ‘The present variety was imported for the Horticultural Society in 1820, by Captain Mayer, of the honourable E. I. Company’s ship Atlas. [BM t.2556/1825]. ‘Of middling size, and with flowers in the middle season, but nearly twice as large [as many in the group].’ [FC p.73/1833]. 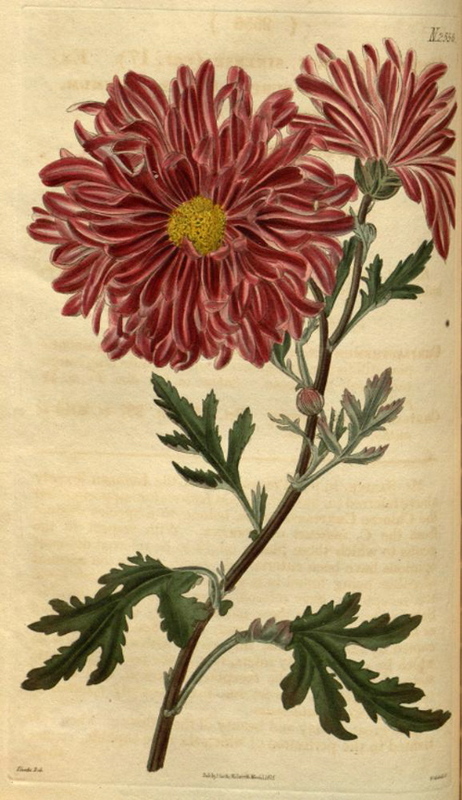 Figured in Curtis's Botanical Magazine [BM t.2256/1821] and very similar to the purple cultivar earlier figured. [BM t.327/1796]. Listed in the 1845, 1850 and 1857 catalogues [H.63/1845].